You’re crazy about Canada, eh?! So, why not use your home’s décor to express your love of this beautiful country? Keep in mind Canadiana décor has a rustic, comfortable feel to it. 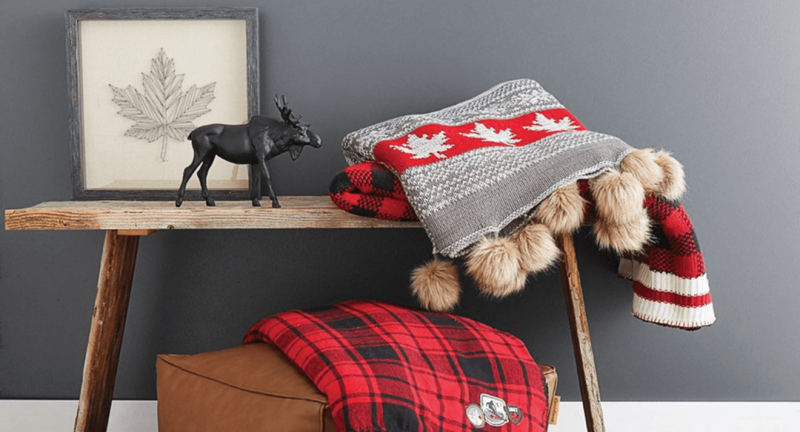 Take a look at several fun ideas for giving the rooms of your home a big dose of Canadian flair! A comfortable sofa is a must-have in any family’s great room. Since grey is a typical colour used in Canadiana themed décor you may want to go with a sectional sofa in a soft shade of grey. Add some white throw pillows featuring a zig-zag pattern in bright blue or yellow to create a dramatic contrast to the grey background of the sofa. If you prefer a bit more colour, think about a rusty red or deep cranberry for the fabric of your sofa and chairs. You can emphasize the colour of your sofa and chairs by getting curtains in a different shade of the same colour. Your kitchen can contain a collection of modern appliances and still have rustic flair! One idea is to get an oval hanging rack to position above your kitchen island. Hang up your collection of copper cookware and you’ve instantly added a rustic touch to your eating area. Find a few stools made of weathered wood for seating at your breakfast bar. Hang some artwork featuring a pencil drawing of a Canadian moose, a painting of a few wandering Grizzly bears or a flock of Canadian geese flying over a lake. Another idea is to decorate one wall with peel and stick wall panelling designed to look like weathered barnwood. Dish towels in red and white are a nice finishing touch. Bring some of Canada to the décor of your powder room by adding a few things to the space. A large mirror with a frame made to look like weathered wood from a farmhouse is one idea. Also, put up a towel rack made of wood matching your mirror’s frame with old-fashioned iron hooks for your towels. A wicker wastebasket is a fun addition as well. 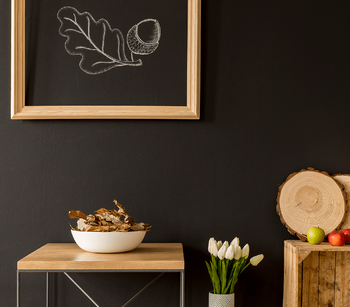 These are all simple items that help you create a rustic décor. Find some washcloths and towels in white decorated with a single red maple leaf. Your guests are sure to notice your love of our picturesque country as they wash their hands in your Canadian-themed powder room. Other colours for Canadiana décor include navy blue and deep green. These colours are perfect for creating an inviting guest room in your Calgary home. A navy-blue comforter on the bed along with matching sheets and pillowcases sets a pleasant scene. You can lighten up the navy blue a little bit by getting a comforter with white piping along its edges. 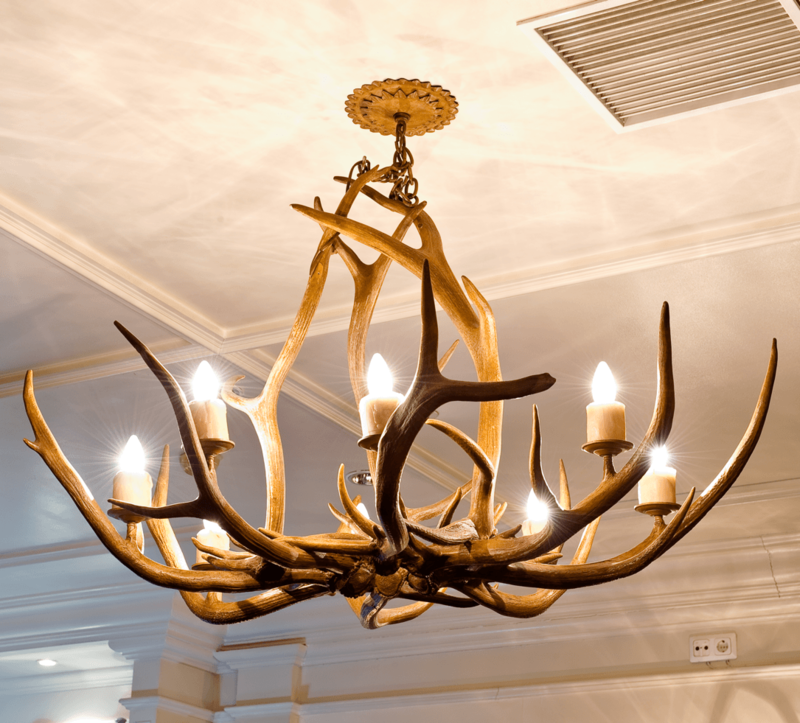 For your guest room lighting, get a couple of lamps with a base in the form of an iron lantern, deer antlers or a pine tree. Consider getting a lamp with a lampshade featuring the silhouette of a family of bears walking through the woods. Just think of how surprised your guests will be when they turn on the bedside lamp to see a Canadian silhouette on the shade! Place a small table made of weathered grey and white wood in the foyer. This would be a great place for keys and mail. Set out a beige welcome mat with red maple leaves mixed into its design. A white throw pillow with the silhouette of a bear on it would be fun to put on a bench or chair in your foyer. Create an accent wall in your master bedroom conveying your love of Canada. One idea is to put up textured, cream-coloured wallpaper displaying a scene of falling maple leaves. Or, go with a forest scene featuring a beautiful Canadian moose standing amongst the trees. This type of wallpaper is SO realistic it’s likely to get a double take from guests passing by your bedroom. You can echo the elements of the accent wall in your master bedroom by putting up artwork featuring Canadian wildlife. Also, it’s easy to mimic the colours of your accent wall in the lampshades, curtains and knickknacks around the room. A tall, dark green or blue vase filled with long stalks of dried wheat. A white throw blanket on a sofa or bed decorated with red maple leaves. A colourful vintage poster featuring a cabin and a lake with the Canadian mountains in the background. A couple of slatted, white rocking chairs with a bright red cushion on each one to represent Canada’s colours. Finally, whether you go all out and decorate an entire room with a Canadian theme or sprinkle in a little Canadiana here and there, your guests are sure to appreciate your unique décor!